On Friday night, I arrive at Seager Parking Area at 2:0 AM. The temperature is 10 degrees. 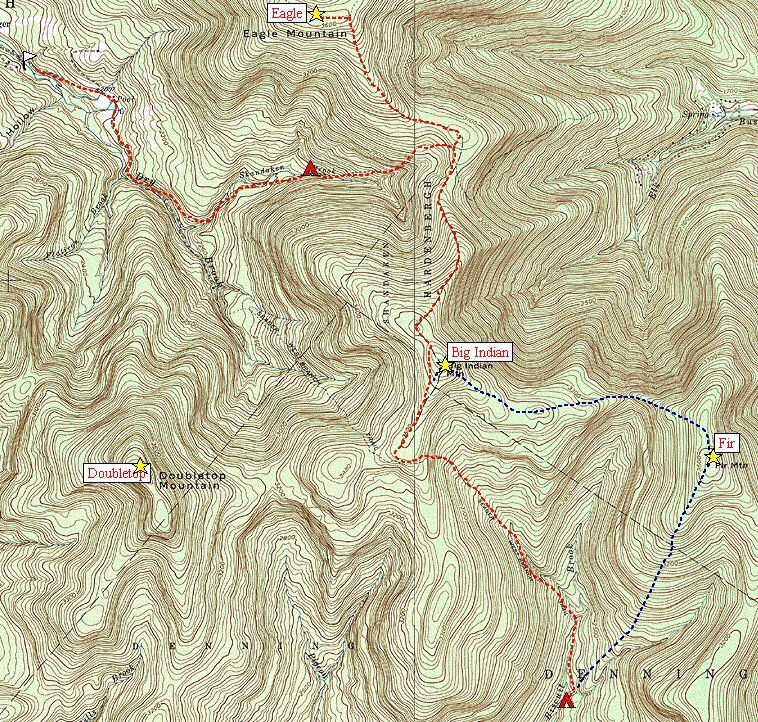 I want to climb Eagle, Big Indian, and Fir on Saturday, then camp at the Biscuit Brook leanto. Then the plan is to climb Doubletop on Sunday. I think it best to sleep in back of car, which is reasonably comfortable. Leaving trailhead at 8:30, the snow is only a few inches deep and the footing is pretty secure, so I carry my crampons. I am breaking trail the whole way. It is very cold. Based on my experience two weeks ago, when I had trouble getting across the stream, I cross at the bridge and make my way upstream on the left bank. The other stream crossing go easily because they are mostly frozen all the way across. I put on Kahtoola crampons at Seager Leanto. Did they help? Maybe, but the snow gave pretty good footing anyway. Kept them on until part way down Fir. They had started to come off every hour or so, so I just carried them on my belt. On Sunday I did not use them, and did no notice much difference, but I was on broken trail all day. Verdict: undecided. I reach the trail junction by 11, then turn left to Eagle. I reach Eagle at 12, still breaking trail. There are two parties of four at Eagle summit. I go off looking for the actual summit, and by the time I return they are both gone. They came from the other direction, so were no help in breaking trail. Back to junctionI push on to Big Indian, which I reach by 2:30. It is very cold at the summit. Leaving the marked trail, I head toward Fir, even though it means I will probably be coming down after dark. The compass acting up (both of them). They must be affecting each other. I turn off GPS compass and use the track instead. Staying just t its right, I follow ridge successfully to col, then head back up. The correct route is not at all obvious. I cross back and forth on the ridge, to make sure I stay close to the top. Because of a mixup in the waypoints, I thought Fir was a half an hour further when I looked up and saw the canister five feet in front of me. The peak was very cold and windy, giving a chill stopping to sign in. I stayed just long enough to take a picture, and then headed down. The correct way down was confusing in the waning daylight. Kept following a light, which seemed to be coming directly from the leanto. I decided there were already people there, a conforting thought. Mayb they will give me something warm to drink. When the leanto lights wre no longer visible, I navigated by a star near the horizon, which kept me on course. 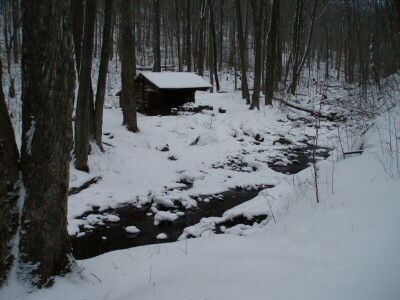 I arrived at the leanto at 7:00 -- alas no one was there, no recent tracks even. My new gloves, jacket, and headlamp were immensely useful. Almost all water I had was frozen, but I warned it up and melted all the ice, then made a hot water bottle. I ate frozen salami sandwich, originally intended as my lunch. I really have not stopped to rest all day long. In bed by 8:00, I changed to dry underlayer. Shivered for about an hour, then slept pretty well al night. My feet were never warm. I should have put on my dry socks. The hot water bottle was wonderful. In morning, water bottle was still body temperature, and wa a pleasure to drink. During the next hour I melted snow to make a little more than 1 quart of warm water. Did not have patience to make breakfast. While I was melting snow, I packed up. The thermometer read 5 degrees. Camera and GPS batteries would not work until warmed up inside my gloves. Left leanto at 8:00. I climbed up the trail toward Big Indian. For the first time the trail was broken -- someone must have come down from Big Indian on Saturday. I arrived at Doubletop junction by 10:00. Feeling very tired, I decided not to attempt Doubletop. I guess my nerves were a little frayed by yesterday's ordeal too, although physically I was feeling pretty strong. Going to Doubletop would have meant another day of breaking trail, hiking to nearly dark. I had had enough fun. Following my own tracks now, I reached Seager trail junction by 11:15. On the way down, I met three parties on their way up. By now, the trail is well beaten down. The stream crossing was easy, bridged over completely with ice. I arrived back at car by 1:00. Lessons: It was a challenge keeping warm, especially my hands. I had heavy gloves, which were really hard to get on if my hands were wet, which happened a lot. They got damp, from the inside or out I do not know, but if they were off for over 10 minutes they froze and it took a while to thaw them out again. I was sweating going uphill, fouling my glasses, a major problem. My hair froze, and then kept getting caught in branches. My beard froze, which was not as much of a problem. The boots were frozen in the morning, making them a challenge to get on, but quickly thawed and within 10 minutes my feet were warm again. I learned to do a lot of things with gloves on that I would not normally attempt because hands were so cold.